Luke was 3rd out of the water, 56 seconds behind Andy Potts and with a group that included Pete Jacobs and Frederick VanLierde. With a group of top contenders a few minutes back, he led the charge to pass Potts for the lead after mile 10 and held it through mile 47. He averaged 290W (4 w/kg) and 25.5 mph during the first 44 miles of the bike. He maxed out at 627W. This is what it takes to lead the bike in Kona. This aggressive start may have caught up with him. The strong effort of 290W (80% of his FTP) from T1 to the turn around at Hawi kept Luke in the top 3. But, on the return trip he dropped to 238W average for the remaining 53 miles. He was 8th off the bike. Impressive effort by Luke in the 93 degree heat. An athlete loses 2 to 3% of their body weight during an Ironma. For Luke, at 160 lbs. that equals 5 to 8 lbs. Reporting an illness a few days prior to the race, Rachel still had a good swim and came out of T1 in the top 10. Despite making her day’s best effort at 212W (3.7w/kg) for the first 60 minutes, she remained around 8th place for the entire bike. From T1 to Hawi Rachel averaged 202W (3.5w/kg) for 2:44 and was in 6th place. She started losing ground around mile 60. 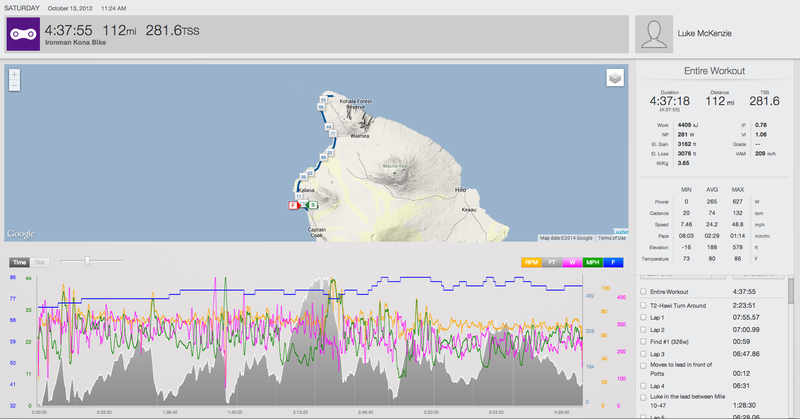 From Hawi to T2 her avearge watts dropped to 159W (2.8w/kg) for the remaining 2:38 of the ride. She entered T2 in 15th. 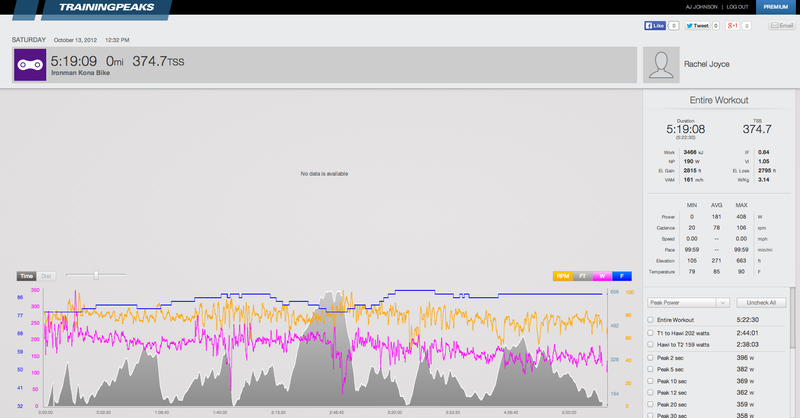 Rachel appears to like pushing a larger gear at a lower cadence than what is typical, averaging 78rpms for the bike. This is more of an issue of personal preference than performance, as a couple of athletes within the top 3 have also been known to pedal at lower than the “typical” rance of 85-95rpm. Another possibility is that athletes are able to use less “heart” at a lower cadence so with her upper respritory illness she may have been pushing a bigger gear to lessen the strain on her breathing. To stay in the top 10 for the bike, Rachel spent 45 minutes of her ride “red lined”. That is, 20% or more higher than her average power output for the day of 181W. This occurred early on as she fough for a good position. Keep in mind the fact that she’s recovering from an illeness- that amount of time in the “red” is the effort of a determined competitor.